This is a Testors Gloss Enamel Paint Kit. For Use on Wood, Metal, Paper, China, Glass and Most Plastics. This is Testors' Model Building set for Plastic Model kits. 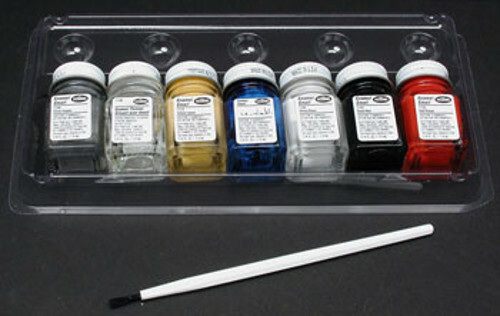 This is a Testors Auto Detail Enamel Paint Set. Used for Detailing Models of Foreign and Domestic Automobiles and Trucks. FEATURES: Eight enamels and thinner, stored in a convenient organizing tray. Paint colors are conveniently featured on the back of box packaging. REQUIRES: Use included thinner for clean up. This is a Testors Aircraft Finishing Enamel Paint Set. Used for Finishing Models of Foreign and Domestic Aircraft. FEATURES: Eight enamel paint bottles and one thinner, no lead. Paint brush included with efficient organizing tray. This is a Testors Spraying Acrylics Kit for Military Aircraft. spraying tool, especially Testor Airbrushes and Sprayers. This is a Plastic Model Finishing Set for Aircraft and Military Figure from Testors. INCLUDES: One Plastic Model Finishing Set for Cars and Trucks. This is a Testors Enamel Paint Set.